March 19-- Mr. Stanton Evans “Scooter”, age 70, of Glenwood, died Saturday, March 16, 2019, at Navicent Health of Macon after a sudden illness. Stanton was a native and lifelong resident of Wheeler County. He was a truck driver for 47 years and currently worked for Browning Pinestraw of Alamo. He was a veteran of the United States Navy, where he served in the Vietnam War and was stationed on the USS Midway. Stanton was Baptist by faith and a member of Beulah Baptist Church. He is preceded in death by his mother, Lorene Smith; and his sister, Allegra Day. He is survived by his wife, Shannon Evans of Glenwood; four children, Shaun Christopher Evans of Delray Beach, FL., Dustie Brown-Ligeikis (John) of Forsyth, Kellie Brown of Dublin, and Chrissi Smith (Jeff) of Dublin; seven grandchildren; Amber Cummings, Brandon Brown, BreeAna Ligeikis, Johnathan Ligeikis, Madeleine Ligeikis, Alex Ligeikis, and Christina Ligeikis; two great-grandchildren, Ty Copeland and Trevor Cummings; and his brother, Keith Evans of Columbia SC. He is also survived by three nieces. The pallbearers will be Jamie Ricks, Bodie Stokes, Shawn Ricks, Leigh Ricks, Tyler Horton, and John Ligeikis; and the honorary pallbearers will be Kale Ligeikis, Brandon Brown, Trevor Cummings, Bobby Browning, Leslie Browning, Amy Johnson, and Tom Weatherby. Funeral Services for Mr. Stanton Evans “Scooter” will be held Wednesday March 20, 2019 at Stewart-Rosier Funeral Service Glenwood Chapel at 2:00 PM with Reverend W.R. Connell officiating. Interment will follow in Beulah Baptist Church Cemetery with military honors. The family will receive friends for visitation Tuesday evening from 6:00 PM until 8:00 PM. The family will gather at the residence of Mackie Ricks at 49 North Broad Street, Alamo, GA 30411. 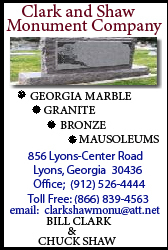 Stewart-Rosier Funeral Service Glenwood Chapel is in charge of funeral arrangements.